OMG Public parks grade playground springer rocker ride units. 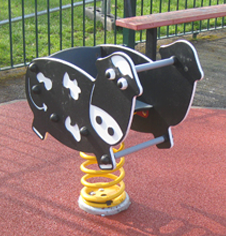 High quality PVC laminate construction with heavy duty springs in a variety of designs and bright colour themes to suit junior users. Robust anti vandal construction with colour options. Mounted directly into ground with a 15 year guarantee on all steel work. 2+ yrs Dolphin play area springer ride ESA450. 2+ yrs Surf Bus play area springer ride ESA51. 2+ yrs Sheepy play area springer ride ESA52. 2+ yrs Moo Cow play area springer ride ESA53. 2+ yrs Hound play area springer ride ESA55. 2+ yrs Rooster play area springer ride ESA54. 2+ yrs Cadet play area springer ride ESA58. 2+ yrs Skate play area springer ride ESA60.